Banner for the 22th Regt. U.S. 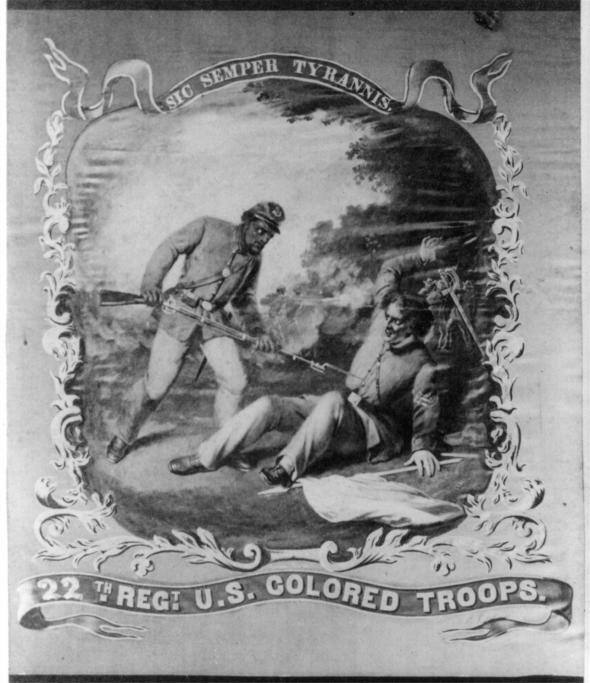 Colored Troops, by David Bustill Bowser. Organized at Philadelphia in January 1864, the 22nd U. S. Colored Troops Infantry Regiment lost 217 men during the last year of the Civil War. David Bustill Bowser was a self-taught black artis; he designed regimental flags for eleven African-American units and also painted portraits of Abraham Lincoln and John Brown. What I find interesting about this particular image is that Bowser utilized the Virginia state motto before Lincoln’s assassination in April 1865. We almost automatically associate this phrase with Booth’s deed. The Confederate has tossed aside his sword and flag and must await his fate, which is now in the hands of what I assume to be a former slave. The tables are now turned and both the future of this Confederate soldier and of the South rest in the hands of those who were once oppressed. This is a very powerful example of the emancipationist legacy of the Civil War. Note: Assuming that the soldier is a former slave than this is also an interesting example of The South v. The South theme. The wise Englishwoman Frances Trollope, in her notorious “Domestic Manners of the Americans” (1832) noted the persistent habit among white Americans of loudly proclaiming the doctrine that “all men are created equal” one minute and thrashing their slaves the next. David Bustill Bowser cleverly took a cherished motto and turned it 180 degrees in this brilliant banner. He and Mrs. Trollope came from manifestly different backgrounds, but they were both on to something here. That’s a remarkable depiction, especially in that it is nearly identical to one created by a Confederate prisoner at Point Lookout in 1864-1865 (with a distinctly different message). There were clearly competing legacies of emancipation even before the war ended. Without trying to read too much into Bowser’s banner, what stuck me was the lack of mercy shown the prostrate and (now) unarmed Confederate. The Confederate government refused to accord black soldiers POW status, and many CSA units fought under a black flag when fighting black troops, refusing to give any quarter. These actions were done to terrorize black troops and keep them out of the war. Instead, black troops often also refused to allow Confederate troops to surrender, a practice which Bowser’s emblem seems to both reflect and justify. Great stuff Kevin. Nice to hear from you. I think you can go either way with it. Either he is about to kill this helpless Confederate soldier in retaliation for the kinds of actions you refer or it could be read as an indication of how the racial hierarchy has now been overturned. I recently read a secondary account of an incident at the beginning of the Petersburg campaign where a couple of captured Confederates were executed by USCTs in retaliation for Fort Pillow. There are a number of incidents of black troops killing CSA soldiers trying to surrender, one of the most notable at the very end of the war at Ft. Blakeley/Spanish Fort, where black troops reportedly shouted “Remember Ft. Pillow!” as they refused to give quarter to surrendering Confederates. This is interesting, as it comes from a Union source. Most of the references to the Fort Pillow rallying cry that I’ve seen are from Confederate sources, many of them post-war, and therefore of dubious reliability. I suspect that many, but not all, of the Confederate claims are exaggerated – as it gave them a ready excuse to kill blacks (though it’s not like they needed much reason to do so). On a completely different note: that banner you put up for your blog is fraud. What’s Steve Martin (fifths from the right) doing in the CW? I knew it, American history is all fluff. That’s it my love. You have insulted the legacy of the Confederacy for the final time. Now you are definitely not going to get any dinner tonight. Wow, that does look like Steve Martin. Maybe Steve’s a decendent of Sterling Price . . . . Look’s like your wife is correct once again, Kevin. Never have I seen a conversation so skillfully diverted. In fairness however, I would opine that it is very likely that each side’s command structure had its share of “wild and crazy guys”. Previous post: Lee for Sale at Mount Vernon?